Next weekend I’ll be cramming a carry-on and heading to fabulous Vermont College of Fine Arts and sure enough . . .
Photo by Vicky Lorencen . Freak out. Meltdown. Keyed up. Pick a label. Doesn’t matter. It’s here–the pre-event emotional mixing bowl of jitters, doubt and insecurity, with just a pinch of dread. Holy synopsis, it’s the night before school starts all over again. Seems any time I’m heading for a writing event—a conference, retreat, class, workshop or seminar, all of my irrational thoughts tap into their stash of steroids and pump themselves up to Library of Congress sized proportions. They tell me lie after lie about myself and my abilities (or lack thereof) until I am left feeling unworthy, talentless and ill-equipped. Maybe even a little gassy. Why am I telling you all of this? You never feel this way. You approach every new opportunity with the confidence of a peacock. I can WELL relate. I was feeling the same feelings before heading off to VCFA for my first semester of grad school there. What I found: my tribe. You will be there maybe ten minutes before meeting some of the best writerly friends you’ll ever encounter. 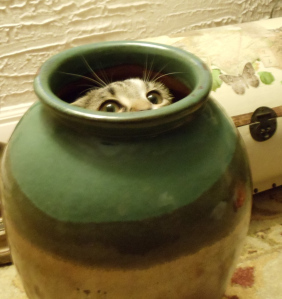 Then you’ll jump out of that big vase thing and feel right at home. 🙂 Wish I could be on my way there, too!